I have had more fun with this song – and even as an ensemble. Purchase 2 bamboo sticks you are in business. Get a few members of your accordion band to watch a few videos and then they can PLAY THE BAMBOO while you invite the audience to participate. Be ready for a Cardio – Workout!!! This is more fun than Jump Rope! This is a Pietro Diero Jr arrangement. 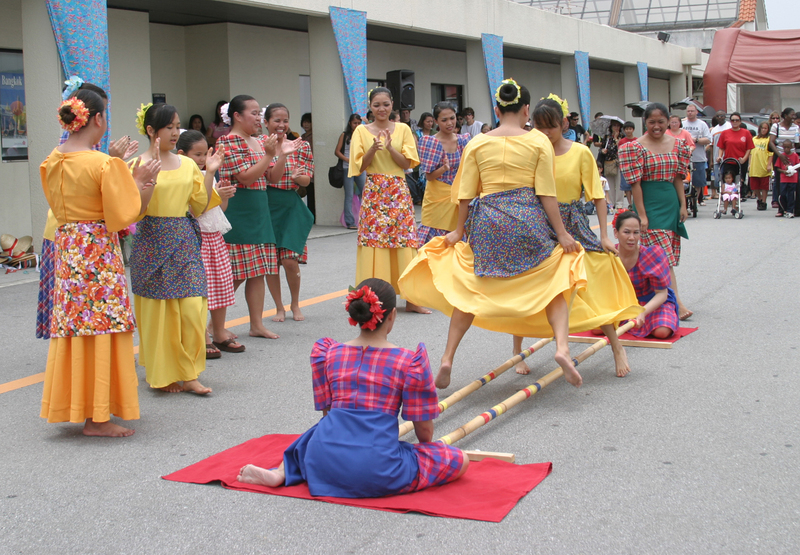 Tinikling is a traditional Philippine dance which originated during the Spanish colonial era. The dance involves two people beating, tapping, and sliding bamboo poles on the ground and against each other in coordination with one or more dancers who step over and in between the poles in a dance. It is traditionally danced to rondalla music, a sort of serenade played by an ensemble of stringed instruments which originated in Spain during the Middle Ages. The dance originated in Leyte, an island in the Visayas in the central Philippines. It imitates the movement of the tikling birds as they walk between grass stems, run over tree branches, or dodge bamboo traps set by rice farmers. Dancers imitate the tikling bird’s legendary grace and speed by skillfully maneuvering between large bamboo poles. We have people from our Accordion Club here in the Houston, TX area – that Travel all the way to Washington to attend this Accordion Celebration. They also have a competition for all ages! Dundy Aipoalani has arranged some level 2 & 3 Solos!! Thank you Dundy – these are great arrangements. He has a Roland Fr8x – so some even have the settings on the top of the song!!! The colored notes in the print out – remind you of the key signature!! AND if you have a difficult time with his bass styles – just play straight basses using his cues. The dotted curved lines in the bass line are just to remind the player that the chord will remain the same for the rest of the measure. The melody is written in two part harmony. Separate these for 1st & 2nd (instant duet) – then add a bass player on the bass line – and you have a trio! the bass style is: Hold the bass – then tap each chord and release the bass when you have played the 2nd chord. The Intro is a KILLER – but the other runs can be done! the bass style is: Play the bass on the count then add the chord and re-hit the bass on the and of 2 or 4. This has a really cool bouncy bass line!!! Dundy also has many more and some great Christmas Music – I will post later. What a lovely song – I am finding it sung in all languages!!! I have attached an arrangement sent to me by Betty Widerski. This song can be played both slow and fast and it really is a nice addition to your international collection! “Bella Ciao” was sung by the anti-fascist resistance movement active in Italy between 1943 and 1945. The author of the lyrics is unknown; the music and spirit of the song is based on a folk song sung by rice-weeders on the River Po basin in the early part of the 20th century (1906) – “Alla mattina appena alzata”. In addition to the original Italian, the song has been recorded by various artists in many different languages, including Breton, Catalan, Chinese, Croatian, Danish, English, Esperanto, Finnish, German, Hungarian, Japanese, Persian, Kurdish, Norwegian, Russian, Serbian, Slovenian, Spanish, Tagalog, Telugu, Thai, Tibetan, Turkish, and Ukrainian. About this time every month (it is 2-25-2015 today) – I go into PANIC mode. I am worried that I have written enough STUFF for everyone, and did I get what I did write – UPLOADED!!! I am busy bouncing between my “working song list” and the SEARCH on this blog – to make sure everything is done. I am really HEAVY this month on Level 1-2 solos. ALSO – on Level 1-2 Duets & Trios. I can follow the HITS on the blog and this is what I am seeing you are opening the most! This month I have created a DUET/TRIO/ENSEMBLE Page. Where NEW and old links will be posted – for your convenience. AND we keep on rolling…..Remember some of these are used in exercises – so please remember to SEARCH for them. This will be a lovely addition to your repertoire. this is a Level 1 solo – and we will use it as a LEARNING experience – to learn to ACCOMPANY as well as ADDING chords to the simple melody Line. This can be played as a DUET AS WELL! The bass line might raise this to a 1.5 level. There is a simple C scale in the left hand as well as a “Shotgun” style bass in measure 30. Search for instructions to play this style bass.